Once you are comfortable with the basic crochet stitches, the possibilities are endless! The best part about learning the most commonly used crochet stitches is that the skills learned from one stitch are applicable and help build the ability and confidence to the next stitch. Complete a foundation chain of the desired length. YO (yarn over) and insert the hook into the third chain from the hook and draw up a loop. You will now have three loops on the hook. YO and pull through all three loops on the hook to complete the stitch. After the foundation chain, you would ch two (chain two) and turn to begin the next row. We will focus on the “simple turning chain” method, taught by Sylvia Cosh and James Walters. The first chain two will not count as your first hdc (half double crochet), but just as a turning stitch. YO (yarn over) and insert hook into the first stitch (i.e., the last stitch from the previous row). YO (yarn over) and pull through all loops on the hook. Repeat process across entire row. Complete a foundation chain of the desired length. YO (yarn over) and insert the hook in to the fourth chain from the hook and draw up a loop. You will now have three loops on the hook. YO and pull through the first two loops on the hook. YO again and pull through the remaining two loops on the hook to complete the stitch. After the foundation chain, you would ch three (chain three) and turn to begin the next row. Again, we will focus on the “simple turning chain” method, taught by Sylvia Cosh and James Walters. The first chain three will not count as your first dc (double crochet), but just as a turning stitch. . YO (yarn over) and insert hook into the first stitch (i.e., the last stitch from the previous row). YO and pull through the first two loops on the hook. YO again and pull through the remaining two loops on the hook to complete the stitch. Repeat process across entire row. Complete a foundation chain of the desired length. YO (yarn over) twice and insert the hook into the fifth chain from the hook and draw up a loop. You will now have four loops on the hook. YO and pull through the first two loops on the hook. Yarn over again and pull through the next two loops on the hook. Yarn over once more and pull through the last two loops on the hook to complete the stitch. After the foundation chain, you would ch four (chain four) and turn to begin the next row. The first chain four will always count as your first tr (treble crochet). YO (yarn over) twice and insert hook into the second stitch from the hook. YO (yarn over) and pull through the first two loops on the hook. YO and pull through the next two loops on the hook. YO once more and pull through the final two loops on the hook. Repeat process across entire row. 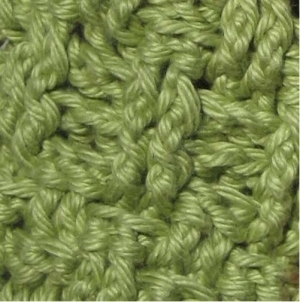 Double Treble Crochet: After completing the foundation chain, yo hook three times and insert hook into the sixth chain from the hook. Yarn over and pull through two loops four times to complete the stitch. Chain five to turn and begin the next row of stitches. Triple Treble Crochet: After completing the foundation chain, yo hook four times and insert hook into the seventh chain from the hook. Yarn over and pull through two loops five times to complete the stitch. Chain six to turn and begin the next row of stitches.